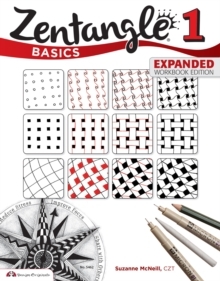 Zentangle Basics introduces you to today's hottest trend in drawing meditation. Using only pencil, pen and paper, you'll learn how to draw 25 original tangles and discover inspiring ideas for incorporating these designs into your art. This expanded workbook edition includes a bonus section where you can get started with warm-up exercises, practice tangling, and experiment with strings and shading. With benefits including stress relief, inspiration and improved self-esteem, Zentangle can be done anywhere and no special 'artistic' talent is required. Tangles can be used to decorate wearables and home decor objects as well as cards, scrapbook pages and journals. Best of all, you can tangle even if you have never drawn anything before.